I briefly pondered tucking a recent photo of clothes blowing on a line here this morning and then thought that my wind horses (lungta) were more appropriate to the subject matter. The title for the sequence in my artist's portfolio is "tattered prayers", and that is how I think of them - as prayers blowing in the wind. The word zephyr comes to us through the Middle English zephirus, the Latin zephyrus and the ancient Greek zephuros, all originating in the Greek zophos meaning west. The god Zephyros was the divine personification of the always favorable west wind, and for many centuries, zephyr meant simply "west wind". Beginning in the 1600s, we used the word to describe a light refreshing wind or a pleasant breeze, but there is fair bit of amplitude in present parlance - these days we use zephyr to describe everything from a light puff of air to a veritable typhoon. When I think about the word, I find myself remembering a favorite quotation from Toni Morrison's strange and beautiful Book of Solomon. Curiously enough, the word zephyr does not appear in her novel, but a brief memorable sentence from the work lingers: "If you surrender to the wind, you can ride it." Morrison's novel chronicles the lives of four generations of black families living in the south, and it's a gorgeous work of magical realism, one in which fathers take wing in clouds of rose petals, matriarchs cast spells, and fey enchantments abound. Lyrical, earthy and sublimely poetic, Morrison's creation makes fine reading on a velvety summer night, and I am doing just that now. Summer is a good time for revisiting the ancestral and mythic, and Margaret Atwood's creation is next on my list of readings. Ancient Greeks, fine poets and writers of mythic fiction understand and remember what this muddleheaded female being is always forgetting and needs to be reminded of: that what is wild and luminous and sacred is right here in the many small and common happenings of everyday life. 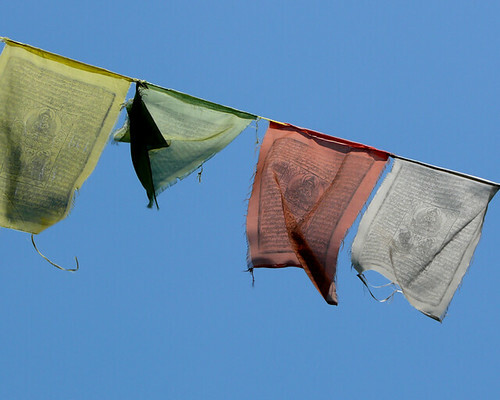 I love my prayer flags. They are in the woods. In this area people not familar with them and some ask "what are they"
"that what is wild and luminous and sacred is right here in the many small and common happenings of everyday life." Cate that is so beautiful and I love the quote too, about surrendering to the wind and riding it. Just what I needed this morning.